The financial news has been so intense this week that I’ve all but given up on trying to blog it. Twitter‘s where you’ll find most of my comments on the tumult in Europe and the US. Amid markets falling and politicians on both sides of the Atlantic flailing, one bit of rather shocking news did stand out: Standard and Poor’s Milan offices were raided on the orders of a prosecutor’s office in the small Pugliese town of Trani, ostensibly on the behalf of a consumer right’s group.There is little doubt that the raid was politically motivated. There will be strong pressure on credit rating agencies, and the demand for transparency, and further regulation. After Italian police have raided the offices of S&P and Moody`s in Milan, there have been reports on the credit rating agencies` compliance with regulative issues. Simply put, all these factors far outweigh whatever infelicities the ratings agencies may have committed. 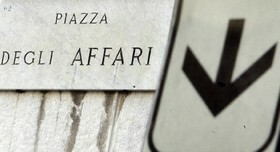 The raiding of the Milan offices this week is widely seen as a political move designed to discredit the agencies to outside investors. Sowing distrust and confusion is, sadly, a time-tested way of doing politics and business in Italy. Ratings agencies can make mistakes, they too can be political, and they probably need better oversight — but not all of Italy’s problems can be laid at their doorstep and that of the speculators. This entry was posted in borsa, eu, financial crisis, italy and tagged debt crisis, eurzone, italy, Milan, ratings agencies, standard and poor's. Bookmark the permalink.